RESEARCH. Stakeholder Interviews. Brand & Business Audit. IDENTITY. Logo Design. DIGITAL. Web Design & Build. Association Haitienne de Developpement Humain, (AHDH), is a Non-Profit organization founded in November 1986 to promote the betterment of Haitians through humanitarian programs that focus on healthcare, education, culture and development in Haiti. AHDH was formed by a group of Haitians living in New Orleans, Louisiana who have pooled their professional, intellectual, economic and cultural resources for the betterment of Haiti. AHDH needed a logo refresh maintaining most elements of the old identity, but making the logo more contemporary. 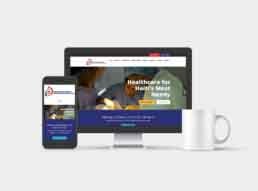 The backbone of the project was to build a website that would communicate the vision and mission for AHDH through impactful storytelling and design. We indulged in a light evolutionary refresh of the original logo, all the while maintaining the same look and feel and colour scheme. Next, we went to work to create a responsive website including the sitemap, page design, website build, testing and launch. The website includes information that communicates AHDH’s cause, hosts quarterly update reports, houses a picture gallery, facilitates donations and provides some FAQs about Haiti. The AHDH website was highly appreciated by the client and concerned stakeholders. Since its launch in 2017, AHDH has been in a better position to communicate its core focus, values and work and has also actively raised contributions for its cause.